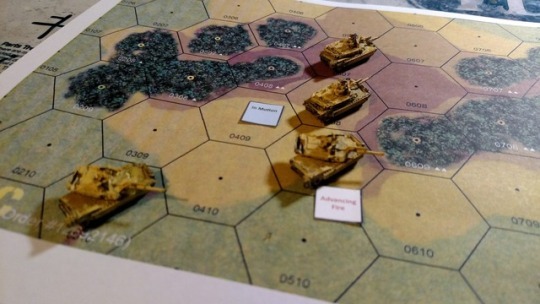 This rule system evolved from many play sessions of WRG’s “Wargames Rules 1950–2000,” Advanced Squad Leader, Panzertruppe, and so on. The objective is a fast moving game that provides verisimilitude, and addresses basic problems present in many games with reaction to enemy actions. The figure scale is a single vehicle or squad of infantry, with a turn covering (very) roughly five minutes of combat. The rules are written to allow hex or map measurement, with one unit of distance equaling 50 meters. Typical scale is 1”=50m as a decent compromise between the scale of micro-armor figures and playing spaces. This game is related to Armored Fist, combined arms rule system for World War Two combat. Regarding your "Bogging a Vehicle" addition, in the US military the term "mired" is typically used. You may want to throw the word somewhere in the section on your next update pass. Also rollovers (i.e. overturned vehicles) aren't uncommon and they are typically more dangerous for the crew. Thanks - I'll probably go of some variation on "Bogged/Mired" as the title for the rule section. Good point also about the risk of rollovers. We're abstracting what happens to the bogged vehicle in the rules but I guess the unbogging process should have a way to end up with permanently disabled.